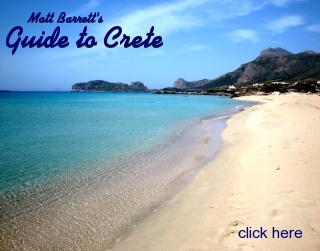 What Do Greeks Say About Matt Barrett's Greece Travel Guides? I am one of the visitors of your web page (http://www.athensguide.com ) and I am really glad of what you are writing in those pages, since I am a Greek and I know how accurate are whatever you write in there. Please accept my congratulations, for the quality of your web page and the honest way you are describing everything in there. It seems that you have worked very hard to create this web page and I totally appreciate your hard work! I have been surfing in your web site for only 30 minutes and I felt that I wanted to express you how much I am enjoying it, so I decided to write you this note. "BRAVO" again for the GREAT work! I hope you keep working in this page and let American people (and not only) know more about Athens/Greece. Reading the "testimonials" pages, I think EOT (greek tourism organization) should pay you a mothly salary for the services you provide in promoting Greece as a destination! You do a far better job than they do! I am Greek living in Athens, but I have many friends and colleagues abroad. They all ask me where to go in Greece, how to go, where to stay, what to eat, etc. Ever since I came across your site, I just send them the link and I'm done. They all come back to me saying how great their vacation was and how much your info helped them. I have never laughter so much for a long time. Thank!! do ! Keep on updating your site. Greece, good or bad, like the driving licence story. someone for his web page. I haven't seen a more helpful and ingeniously arranged travel site than yours. I am a Greek who lives in the USA and I learned more about traveling in Greece than I ever knew before. I will certainly take advantage of the valuable info you have so lovingly arranged in your site the next time I go back for a visit. with the kinito and the frapedaki on top. It's as much part of Greece as the Acropolis! I will consult your site. I m a 23 years old student from Greece and I live in Athens. Some friends of mine from Portugal are going to visit me in August and I needed some info and ideas on where shall I take them and what parts of Athens shall I show to them. I must admit that you have done a very good and complete job by having this site full of tourist information and personal experiences. I guess you really love my country! All this information helped me so much to decide what to do when they get here. And imagine I was born and raised in Athens! I would like to thank you for your effort and ask you to keep up the good work. If you ever need my help on something, please go ahead and ask me. I want to help Athens be more popular, friendly and open to tourists. PS: I was completely amazed by your 25 tips to survive driving in the greek streets. It made me laugh big time. Too bad all of the situations you described are completely true. Never in my life have I seen such an A-WE-SO-ME tourist guide than yours! especialy the American people, about Greece, its history and its people. Hve you ever thought of turning yourself to a US ambassador to Greece? I am sure you would do a superb job! A highly -soon to be a US citizen- appreciating Greek! Not sure where I am supposed to send this, so I used this address. needs a lot of work, but the content is plain perfect. all this great stuff you have gathered here. thank you for the beautiful site you have made for Athens. I was looking for old photographs of Athens to feel a little bit better for Greece's current status and I bumped into your lovely site. I have just finished reading your stroll with your baby and wife from Plaka to Kypseli, hmm well done! I laughed at least 10 times and at the same time realized that I am not a strange person for being exhausted each time I leave the center of Athens! I am glad that someone came to visit and liked it. I am also glad to see foreign people, if I wasn't afraid to be considered weird I'd invite them for a frappedaki and a cigarette conversation to hear their reason for visiting and their background. Greece surprises even me by the versatility of the beauty (plus it is November 6th and the temperature is 23 degrees celsius!). I also have this undefined perception that the land (the ground, the earth) has a character and a strength of it's own that is rising from the soil, something wise and happy (especially the areas where ancient Greeks chose to build monuments). So, thank you again for the site and wish you and your family the very best! I was feeling a little homesick tonight, so I found your article on Monemvasia. I haven't been there in nearly eight years, but growing up, our family visited every few years or so. My dad came from there, and being Greek, is related to nearly half the town. A lot has changed since I was there last; more Westernized, more technologically advanced. But the ocean is the same, the winding road and the near-deadly heat. The flying dolphin, the stark beauty...I sometimes wonder if Angela's House, a hotel up a road just as you come into town is still there, whether the cafenio where we used to get our afternoon ice cream and frappe is still operated by the same old man. The octopus hanging on ropes around the outside seating areas were never meant for weak stomachs, and we would watch as the young boys, having caught one of the things, pounded it against a rock out by the ocean. You mentioned the German tourists turning places into summer homes. I remember laughing at them when we went over. Going to the ocean at noon, in the glaring sun, we knew that they would return looking like lobsters. Mostly, I just wanted to say thanks. You captured a piece of my home, and my memories. In the pictures, I expected to see my aunt and uncle, my grandmother, or friends that I haven't seen in years. Strange how places grow on you. Just a short note to say thanks for having such a brilliant and informative website. My name is Andrew G, I live in Sydney Australia. I took my family (wife and two sons) to Greece last October. We only had 8 days to spend in Greece before leaving for England. We organised our whole Greek holiday based on your website! We stayed at the Volcanos View Villas in Santorini (wow! What a place!) We booked the villas through Fantasy Travel who were extremely helpful and patient. We had George the Taxi Driver's cousin pick us up from the airport. He gave us a one day tour of Athens as well as taking us to Cape Sounion. The tour was wonderful and saved us a lot of time. We went to the Acropolis, the Cape, Syntagma Square, drove along the Agean coastline (beautiful), olympic stadium (old one). In Athens we stayed at the Hotel Attalos (which was again booked by Fantasy). Everything was perfect. The hotel is just as you said - friendly and close to everything! I would and have recommended your site to everyone I know. It is a blessing for all travellers to Greece, that caters for both the experienced and non-experienced travellers. Thank you for making our Greek holiday an unforgetable experience! Hello my name is Christine and I am from Greece. I just read your travel guide to Greece and I would like to thank you for doing such a great job on your site, it really made me feel proud for being Greek (not that I wasn't, you just made this feeling stronger). The truth is that this is one of the best guides I have ever read. I hope you will be back to Greece soon and if you have travel guides for other countries too I would really appreciate it if you could e-mail me the the site. Thank you in advance. I would like to thank you for having written all this for Greece. It is so deeply real and true that it astonished me! Thank you again, for making me feel good for being greek through such difficult times! My name is Maria. I live in a city called Clearwater in Florida. I was born in Nikea-Pireus, moved from Greece at the age of 9 and raised in NYC. At the tender of age of 17 we moved to Florida when my parents decided they had enough of NYC winters and the landscape/climate of Florida was closer to that of Greece. I have been back home in 1989, 1990 and then after a long 16 years of traveling to various other countries, marriage, divorce etc. returned to Greece just this past June with my 12 year old son, Alexander. Alex stayed with me 2 weeks, we traveled to Hydra, Ermioni, Salamina and did the Athens/Acropolis/Plaka tour. I spent 2 weeks with family/friends traveling to Kefalonia, Ithaca ( my mothers place of birth ) and the Island of Paros. Unfortunately I had to come back to the states. My son, my job and immidiate family are here. All of my dads side of the family live in Greece. To say the least I feel SICK not just homesick...I have lived in the states since 12/1969 and have been naturalized but when I tell co-workers I am going back home they cant relate. Your web site has eased the pain of being so far away from Greece and not being able to live daily life in their. I read a portions of your site every day...the portion on the history of Greece has been amazing and I thank you for all the hard work you put in it. It has put so many fragments of my countrys history in perspective. I have already purchased my ticket for next year...I have 240 days left for another 4 weeks off and cant wait. I have done a lot of research as to where to go next year...again EUXARISTO POLI. managing to make me this homesick... Keep up the good work! Yia Sou Matt Barrett ! other people that I used to see. Bravo ! Ise katapliktikos. Na isaste kala....esi ke i ikogenia sou. you were a visitor or a fellow Athenian. Great work! hours navigating around your site. Matt, I believe that you deserve a medal from the Greek government! traits of the American people. Hi Matt, I have been visiting your site for quite some time and decided to finally e-mail you. I live in Melbourne Australia. My parents were both Greek migrants to Australia in the late 1960�s. I was born here so consider myself Australian of Greek background. Just thought I�d drop you a couple of lines to let you know that your Greece Travel and Athens Survival Guides are awesome. They would have to be the best websites for info and photos on Greece I have been able to find on the web. 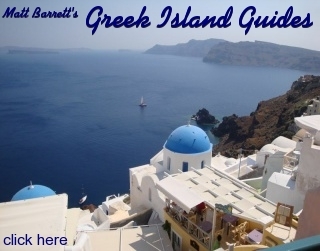 If I didn�t know much about Greece, I would want to visit after seeing you website. You do a far better job than the GNTO, but like you said it�s your passion, that�s why it�s so good. I have been to Greece several times the last time was in 1995�.quite some time ago now, but I totally agree with you, there is something about Greece that I absolutely love, maybe it�s the laid back lifestyle, like you say you feel like you belong there, it�s full of life. I enjoy looking at your photos, it reminds me of the times I was there, especially the Athens photos as I spent over one year living and studying there, so I remember some of the places in your photos, one moment that will stay with me forever was having a caf� at Plaka with the Acropolis as a backdrop�unforgettable. writing something so close to home! Oh, and I wouldn't recommend the Tower Air cheap flight to anyone!!!! My family took it over this past summer. It left from NY at 12:00 P.M.
and was crowded and I threw up 3 times!!! Thank you again for your humor and wit! but I still look forward to it every time! so all the help I can get is great. Your pages are so helpful Thanks! I would like to tell you how much good your Athens survival guide did to me. wonderful times I had there. that sometimes torment us but always embraces us with warmth. Athens at your feet. At clearer days you can see right down to Pireaus. By the way, can you promote Zaharo Ilias? It is a wonderful place near to Ancient Olympia and many people ignore even its existence... I could send you lots of information needed and many many fotos. Thanks in advance! I was feeling bored, and decided to have a look at the net - no special destination. And I "fell" on your guide on "my" city = Athens. And I don't mean Athens, Georgia (or something like that), but "Atheena". Veeeeeeery amusing!! And you really astonished me with all that info you have. You know -- you seem to be so patient, so humorous, so understanding that you would have liked any place. Good for you. Oh, first let me introduced myself: My name is Alexandra Tsakona and I am an Athenian who loves her city (not necessarily the city's inhabitants). I've been thinking to ask you: did you know that there is an "internet cafe" at the Megaron Mousikees =Athens Concert Hall across the US Embassy? Although the internet cafe you suggest (corner Boulis & Ermou or something like that) is much more practical due to its location, I thought just in case somebody is around the US Embassy, one could be interested in that, too. Should you be interested, the "Megaron" has a site: www.megaron.gr . This contains info on the internet cafe there. As you might see on my e-mail address, I work at the "Megaron", but have nothing to do with the internet cafe. Well, I have to go back to work. Before I leave you, I want to tell you a BIIIIIIIIIIIIIGGGGGGGG "euharisto" (efharisto), i.e. thank you, for what you say about my city! (or try to go) almost every year and all your information is right on. Just wanted to throw you kudos for your website. I am Greek-American born in the states but lived in Ano Glyfada for six years in my early 20's. You have captured the essence of the passion we have for Greece. I sometimes have a tough time conveying the feeling and passion that comes out when you step foot off the airplane in Athens. You my friend "get it". Kudos to you. Dear Matt, I think you do a superb job on your website.Anybody who wants to visit Greece should be informed by it. I also want you to know,that I appriciate the attention you gave to my critisism of the side walks of Athens. I am one of the visitors of your web page (http://www.athensguide.com/) and I am really glad of what you are writing in those pages, since I am a Greek and I know how accurate are whatever you write in there. Your website has been most helpful!!! I can actually say that yours is THE BEST website I have come across while researching information for my upcoming vacation! I am Greek and have traveled many times to my country but I don't think I was ever prepared like the way I am now...thanks to you!!!!! for me to have found your site and George! authentic, New York cheesecake! Amazing, for Athens. This is the coolest website I have ever seen. I'm in Chicago, born in Athens 47 years ago and living in the US since 1955. The Rebetika stuff is excellent. I'm a fan myself. When I was last in Athens, my friend John and I went to a club in the student section between Omonia (my father used to carve souvlaki/gyros there from 1929 till we emigrated) and the University. It reminded me of the Village in NYC but the populace looked more like terrorists. Anyway, we went to a second floor club like the ones you describe, and this fabulous suinger was performing classic rebetika with an excellent band -- excellent. Her name is Voula Sallides. The greatest regret of the last 5 years is not buying her CD there that night. Your friends in New York don't have it. I'm also president of the Hellenic Museum in Chicago. We're going to start a building next year. Very cool. And we do very good exhibits (including one on Greek Music a few years ago.) E-mail me here so we can talk. I'd love to link your sited when we're on the web (early April). We're doing The History of Gyros in the fall. From the moment i came across your site i was taken away!!!!! i thought there is no way i will get a site on the WWW, offering my knowledge and help to those traveling to Greece - this MATT person not only beat me to it, but beat us all to it - LOL - should be Mayor!!!!!!! establishment - for the time -while everyone else had their homes to offer [as you may remember as late as even the very early 80's]. Once again - my hat off to you. Stay well. While I was planning and investigating a 4-6 day side trip to Santorini during my Easter visit to family and friends in Athens I discovered your Web pages. Your Web pages are my greatest find in the Internet since I started "browsing" a year ago. I have visited many Greek Web sites but by far yours are the most complete, informative, and reader friendly. As a native Greek with family and friends in Athens, who has visited home more than 10 times in the last 25 years, I still find your Web pages invaluable. And I have not yet fully explored or read all your info., tips, and suggestions!!! Keep the good work going. P.S. - I just discovered that you and I have the same love "Rembetica". Some other time we can exchange notes on the subject. I also love/get homesick with plakiotikes cantades. Well, "kales diakopes" and keep adding to your website! another side of Mytilene and Lesvos that maybe I have become so accustomed to that now I tend to overlook.Anyway,it's a really great site.Well done! I just visited lesvos.com and I believe that you have done an excellent job. It is amazing how many things you know about the island. leaving Pireaus with Mitilyne on Thursday afternoon. so "Greek". Believe me I know. meters away from you while you having a "meze". I consider that place one of the best places to eat in Lesvos! Just a quick note to say congratulations and thank you for your fantastic Athens guide website. It's by far the best and most useful that I have seen and I wouldn't hesitate to recommend it to anyone who is thinking of visiting Athens . depth of the information provided on your web pages, and the accuracy of it. not visible at all, or took a long time to appear on the screen. For once again WELL DONE Matt!! I truly hope Greece won't let you down! Is it possible to purchase a book on everything I saw in visiting your web site, especially foods, photos, retsina, ouzo, et all?? I was really impressed. Although I have not been back to my place of birth, Athens, or the mainland and islands for a few years, I try and explain what a great vacation in Greece would do for them. I am certain that my two sons would be very interested in such a book, if it exists. Please provide details as to cost, availablity and methods of shipping. I'm trying to meet a dealine for the postal date to insure delivery to an overseas location. Thank you in advance for anything that can be done. Nice to hear from you. I have passed on your site details to many of my travel agent friends. It always helps to be recommended, not that your site needs recommendation it is excellent. It is easy to navigate and full of very useful information. I can see how you enjoy your work and I hope that it provided good business for you. I'm interested in receiving the Greece Travel Newsletter. Your website is wonderful. I had a chance to visit Greece after 26 years and I had a great time. Since I found your website, it's like I'm there. Keep up the great work. Your site is extremely thorough. I'm a Greek that was born in Greece and has lived the majority of my life in the States. I am planning on traveling to Greece this summer with my two small children and I just wanted to let you know that all your information is helpful and very organized. Great work! wanted to let you know I've added a link to your guide in my website. stage to some of the worlds best musicians. This is a great site. Thanks for bringing me back so many great memories. I was 17 in 1972 and I had the same experiences discovering Savopoulo and rebetika at that time. Also, I noticed a small error. The military police during the "hunta' years was called ESA not ELSA. However, it is true that these two words sound almost identical in Greek. By the way, I am still vey fond of the old Sabopoulos music. I used to put my son to sleep by singing to him the "eixa eixa mia agapi ax kardoula mou..."
looking for schools in Athens or Thessaloniki i came across to your website. visit on my 1 year trip to greece next year then please tell me!! Totally by chance I came across your site as I was surfing, I know Greece fairly well but have never lived here until I decided to settle in Athens two months ago, your site is a mine of information for all people who somehow have something to look for in Greece. Thanks to you, I got in touch with a travel agency to make me offers for hiring a boat this coming summer, very friendly people answered back to my email right away. I am a Greek-American born and raised in the US. I have spent my life spending summers in Greece - a few years ago I discovered your website and it changed everything for me! You have made traveling through Greece a pleasure! It is your site that enabled me to have a cell phone delivered to me upon my arrival to Athens a few summers ago. How did I ever travel through Greece without one?? While I'm not quite as Greek-travel-savvy as you are - I like to think I rank - I know parts of Greece as well as my "backyard".. and thanks to your site - I'm learning more and more. Thanks for a great website and all the information/services you provide! I don't know if you remember me. I contacted you last year by e-mail, explaining the situation in Kos island. My name is Katerina Moustaka and I own a rent-a-car business. I saw the work you did about our island. The site is really beautiful and your information is truely impressive. The passage you have written about last year's crisis is really substantial and presents the situation exactly as it is. Your work in general is fantastic. On behalf of the island, thank you very much for everything you have done. Although I have a little complaint. You said you would contact me when you got here, but you didn't. I hope we can meet some other time, so me and my husband can thank you in person. I just could not address you as Mr. Barrett. net for inspiration and places to show my my friend.. I came upon your site and that was it, I was hooked. My best wishes for you, your wife and daughter. I have read lots of the web pages of your Athens Survival Guide, and I must confess that I am very surprised by the deep knowledge you have about Athens. I am greek, living in Athens and I know the city and the way of living here. You have done an excellent job Matt ! You are so real in what you write and you mention details that only an athenaeum is able to know. I have to congratulate you for the rest Greece guide too. A couple of friends of mine from the US were planning to come to Athens and visit me and they asked me to provide them with some information about the city, so that they could have an idea before they come. I just forwarded them your web site !!! When they came here, they told me that browsing your site was like a real visit in Athens. I want to thank you for your great job. It�s honor for our city to have a friend like you. Regards from downtown Athens ! i haven't got this computer for a long time, but the first thing i did, was to look at the sites of my dads birthplace,thessaloniki. I just returned from 2 months in Greece. I had not been back for 3 years and could not believe the changes. I wrote to you last year about having a site on the renovations going on. I thought of your site immediately when looking for old buildings with character, you are correct they are everywhere. I was hoping that you could do a before and after type site. Your site illustrates how passionate you truly are about Greece. I hope you undertake such a site, you are probably one of the few people who could pull it off. page with attribution, and links, of course. After browsing your Athens Guide website I felt that I just had to write to let you know how much I enjoyed and appreciated it. I am a Greek-British national who was raised in Athens as a child (in the Makriyanni neighbourhood), but who has since lived all his life in the UK. For the last ten years or so I have travelled back to Athens as often as I can, probably once a year or so, and in the meantime have to make do with the internet whenever my nostalgia becomes too great. Out of all the numerous Athens websites I've come across, I don't feel that any do justice to the city in the way the Athens Guide manages to, whether in prose or in pictures. I thought the site really puts across your affection for the place, despite the downsides to Athenian life. Wasn't it Melina Merkouri who said something along the lines of Athens being like an ugly woman who, nevertheless, it was impossible to resist returning to time and again? the section on Plaka, which also happens to be my favourite village in Europe, if not the world! your photos of the 2002 snowstorm - I was in Athens myself for Christmas 2001 but left the day before it snowed. Until I saw these photos all I had was a few poor quality newspaper cuttings to try and imagine what the city must have looked like. I also have a couple of suggestions: for learning Greek, I would strongly recommend the Athens Centre located in the Mets neighbourhood (its actually thanks to their website -www.athenscentre.gr - that I came across the Athens Guide) - excellent courses of all levels and durations, good location, beautiful building and helpful staff. Also, for coffee shops, have you tried the Diogenes cafeteria behind Lysikrates monument in the "Dirty Corner"? Its a great place to peacefully sip a frape, away from the main street and, in the summer at least, its shady and leafy. Once again, thanks for your great site - the next time nostalgia grips, I know where to turn! A quick note to congratulate you on a brilliant website. Your love and affection for the country and it's people shine through, page after page and your enthusiasm is infectious. As an Australian of Greek descent (both my parents were born and raised in Lemnos) and currently planning a trip back to the country of my heritage, I have found your website indispensable and a constant referencing point. I have been emailing links to all my friends and relatives and they too are impressed and excited with all your website contains. Gia sas, firstly thank you for responding so promptly to my e-mail.I must infact apologise for my delayed response, but having just flown back to home base and being close to the Greek Easter ,it has been a very hectic time. It was 3 am when the "music fanatic" was sent an e-mail with subject topic"You owe me huge !" Yes, indeed I owe my friend "huge".What a fantastic site.Remebetika music, history and one that "touched" me. Since then I have also slowly gone through your travel sites guides, also very interesting and pleasing. My warmest regards to your family,and I wish you all a Kali Anastasi, Xronia Polla.-Happy Easter. I've been reading your stuff for a long time and find myself going back to it when ever I get homesick for Greece! I am glad to see that your site keeps growing, but still wait to see a book!! I'm guessing that with the Olympics coming up, your query letters should be getting some attention! I'm writing to inquire about the free Greece travel newsletter. If there's anything more that you haven't already said, I suppose it would be in there? Well, I love Greece very much, my husband was Greek and is buried in Messini. We go to Greece nearly every summer, and have an apartment in Kalamata. I, too, am writing a book about Greece, in honor of my husband, which revolves mainly around the food...or rather, takes off from the food and touches on many different aspects of the country and culture. I'm always interested in hearing stories about the food, to share in my book. Maybe someday you can bring the family to Kalamata and learn about the area. It is about to get a major tourist center, well, near there, anyway! So, keep up the fantastic work! Maybe our families will meet some day in the southern Peloponneses! I recently discovered your website and I think it's great!!! I travel to Greece every year and sometimes even twice in a year. My parents were born in Greece and have kept their roots and also have passed all their traditions, religion, customs and all other relations to us. I would like to receive your newsletter. I am very interested. Every year we try (my husband and I) try to visit more and more places. Every year we plan as much as we could from here (Montreal, Quebec, Canada...) Once we get to Grc., it's go straight home (Zevgolatio, Corinth) drop off our bags, get the car ready, and off we go. I could probably keep writing you but I don't want to bore you. i liked the photos and funny comments about the flea market in athens. is not bad for an american site! My grandfather was Greek and I have traveled to this wonderful country many times. I always enjoy the food and have eaten in many of the restaurants that you mention on the web. Lately I have really become interested in the Greek Wines. I discover new ones each time I visit. The Greek people know how to enjoy life. The small village life knows good food and family. Someday I plan to live there for an extended time. Until then... I will dream with your web page. Thank you. I got surprised, because you have "catched the pulse"
of Greece, better than the Greeks! received the Greek culture", so the truth is that you are Greek. I was also surprised to see that you liked Savvopoulos! Dionyssis himself, his music, is Greece! If you understand him, you understand Greece. beaty of this country, not the external, but the spiritual. if not, you have to learn Greek just for this! Anyway, I was looking at the pictures of the street musicians. I show the videos, too. Greece is not what they show in the touristic guides. something totally unknown to me. that I couldn't even imagine before that it could exist! I am sending you some of these pictures as a "thank you". with your website I am tranfering back home..
No specific questions for you, but I am currently planning a quick trip to Greece (I am 1st Generation Australian) with my husband (nervous Englishman) to visit family in Elika (SW of Monemvasia) and I've found your web page of great value - the most informative on the net for information on Greece. My name is Thalia .... yes, I'm Greek American. And a travel writer. (You can check out my books on Amazon.com, if you like. ) I've been to Greece about 10 times, have led tours there, etc. and have been to probably 15-20 islands. I've enjoyed your site SO MUCH-- came across it last night and stayed up into the wee hours, amazed at all you had put together. Now when people call and ask me all sorts of questions about traveling to Greece, I will simply refer them to your site, which has ALL the answers! So thank you for that. Next week we are fling to Europe for a 3-week honeymoon (one year after our wedding, which was in a small town on the Baja peninsula of Mexico). My husband Mike and I will spend a few days in Rome, visit my cousins in Athens, and then, probably go to Santorini. He has never been to Greece before, so Santorini seems like a "must" for him. I usually stay in Oia, but I liked your suggestion of staying down near Akrotiri to be closer to the beach, as well really want to get our beach time in. Then I was thinking of going to Rhodes-- one island I have yet to visit. Mike is an ancient history buff so there will be plenty for us both to see there. And I like the idea of discovering someplace new together on this trip. But your photos of the beach and descriptions of the "resort towns" have made me a little bit concerned. Usually I stay in domatia in fairly small beach towns in whatever island I happen to be visiting. Since it's our honeymoon, we might upgrade a bit, but I'm wondering if you might suggest some quieter beaches or smaller beach towns that don't have flying parasails, rental umbrellas, etc. etc. on Rhodes. Matt, thanks for your great web site and all the work that went into it! I will be updating my first book, A Journey of One's Own, which is going into a Third Edition, after I return from this trip. I will make myself a note to put in a plug for your site in my updated book. we came here to live. fully. Thank you. It must have taken a great deal of hard work on your part. I hope you will be able to keep it up. Good luck. I've just been reading some of your stories about Greece, and I want to thank you for... well, it's hard to find appropriate words - your sincerity, I guess. My parents are Greek, and I used to consider myself Greek as well although I have never had the fortune to spend much time in Greece. I have, over time, come to the realisation that I'm not really Greek and never will be; I'm a sort of hybrid (as you say, I have a "confused sense of identity", but that's ok). I live in Australia now, but grew up in South Africa. In any case, I just wanted to thank you for your stories and to say I hope you keep on writing. Your writing is very vivid, and while reading it I feel like I'm in Greece and am meeting some of the characters you write about. My regards to you and your family, Andrea and Amarandi (what a beautiful name that is). Please don't feel you have to respond to this email (I imagine you get many from strangers all over the world, and that you wouldn't have time to respond to all of them); I really just wanted to thank you for your stories. I just wanted to say that I think your sight is great. It is fabulous and absolutely wonderful. I am Greek myself, born in Australia from Greek parents. Since my last trip to Greece I enjoy browsing the net on sites about Greece which remind me of my holidays there in the past. I must say that your site is among a few sites which does not degrade Greece and embark on miserable stories of bad taxi drivers, unhelpful locals and pollution levels in Athens. All places in the world have a fair share of good and bad and I am glad to see that your site focuses on providing useful information about Athens and Greece which is a necessity for all of us who have roamed the streets and lanes of Athens with peaked curiosity and immense enthusiasm. i have been writing an article on `secret' athens for a greek-australian mag and i came across your site. i lived in athens for a year and a half..and i am extremely impressed with the effort you have put into this site..it is fabulous..and it brought back 1001 memories.so thank you. i will refer my readers to this site. incidentally, just how long were you in athens????? you certainly covered the spirit and breadth of this amazing city which i love so much. i am sighing as i type. temps in the 50's, really quite pleasant weather. procession and worth a mention in your guide. to Athens twice, we still didn't see all the sights. are learning the language, since we plan on visiting Greece every year. very informative. Keep up the good work. Just a Greek girlie from Thessaloniki who was amazed with your site! As an Athenian living at the moment at Santorini island, i feel like i want to give you my congratulations for your webpage about Athens. We all who live in Athens know its serious problem, and we the youngest generation really want to change some thinks in our city. It was great to visit your site, as it was like a nice walk around my beloved city, and actually is the only site or tour guide who really sees beyong the mainstreem. I really believe in this city, and really believe that is amazing to live at this cosmopolitan city. Great depiction both socially and culturally. Being Greek / American and having grown up in Athens I get alot of people asking for all types of information about Greece, usually as a prelude to their travel. Now I have a great web-site to refer them to. the spirit and the temperement of greeks. I have always liked American people but now I like them even more ! little I red I dare say that it is remarkable. you should feel very proud. great guide! we are athenians living here all our life and still we learned new things about our city...! I have to congratulate you on your site "Athens Survival Guide". I live in Athens and I found that all of your comments were very practical and very pleasant to read. I am writing to you in comment of something written in the section concerning the Acropolis. You mention that king Aegeas jumped from the Temple of Athena Nike into the sea; though I am quite sure (unless newer archeological findings find me wrong!) that he jumped into the Aegean sea from the Temple of Poseidon at Sounio. Hope that my comment is helpful or that you will correct me and save me from spreading misconceptions about our history (I am always ashamed when foreigners ask me about our history and I sheepishly smile in ignorance). Your site is really worthy of attention and I hope that the swarms of tourists read it beforehand so they are not as much disappointed by the appalling first impression of the city. intertwining the past, present and overwhelming aura of Athens. You've done a great job! Your site helped even me, an Athenian !!! Your comment are ( almost ) all absolutely correct and objective !! PS:If you come to Athens drop a mail ! traveling in Greece and I just like to say well done. My name is George and I live in South Australia. I've been looking at your BRILLIANT site for a long time now and have recommended it to many others. I've also referred travellers to Greece to stay at the Attalos Hotel after you praised it. The people that stayed there were pleased with the service, location and value. I think the Greek government should give you something (lots of cash and recognition) for the services you provide travellers to Greece. From reassuring them about the place to offering them hands on help to buying jewellery (my brother bought beautiful stuff from Byzantino) and personalised taxi service. When I was in Greece last some years ago I was a bit critical of the place after travelling through affluent Europe and expected my ancestral home to be the one I always imagined in my head of friendly people, beautiful architecture and unspoilt landscapes. Unfortunately I was a bit disappointed UNTIL I got to Ermoupolis on Syros and ever since then I've had a personal love affair with that remarkable port and island. I long to return all the time and often read your write up about it which I reckon hits the nail on the head. I often advise travellers to visit Syros but most don't because they haven't heard about it enough and want to visit the so called "hip' islands. That's Ok as far as I'm concerned. I'd rather keep it unspoilt and leave it for the discerning traveller. A relative that did listen to me and visited the island was most impressed. Ever since I discovered Syros I've been trying to get as much information and pictures about it as I can from the net, but unfortunately there isn't much. There's Mid-America a site about opera that briefly features the wonderful opera house and a few other sites that feature it briefly , but not enough to satisfy my deep interest. I'd very much like to read the complete history of the place as I know it's a very historical and seminal place in Greece's modern history. In a way it's the first Diaspora and as a Greek-Australian even this connects me to the island. One of the main features I adored about it was its well preserved neo-classical architecture with all the detailing in a holistic townscape. This fulfilled one of my fantasies of Greece that I mentioned earlier. Like a classical city recreated in the age of neo classicism. A mini St Petersburg on an island in the Aegean. I'm passionate about Syros and have been trying for ages to get a book or anything in English. At one time it was briefly featured in Odyssey magazine which I subscribe to (they called it one of Greece's most elegant towns), but that was only about the restoration of the theatre and still not enough. Now I am back at university after working in Japan and am studying Cultural Tourism as a Bachelors degree at university. We've been assigned to choose a cultural city and to do a project about it. I have gathered as much information as I can about Ermoupolis but it's still minimal and decided to turn to you, the guru of Greek travel to see if you can help me. I need a book(s) preferably with pictures on Ermoupolis and Syros and will be most grateful if you can direct me to this pursuit. I've been unable to get one online and need it sent from Greece somehow, if one exists. Surely there must be one if not many. I will pay you whatever you think is fit for this request. I hope I'm not wasting your time and I understand if you are too busy to help, but I feel we share a 'kindred spirit" on Syros. I have exhausted all avenues in attaining what I want from thousands of miles away. I would like in this e-mail to congratulate you for your website about Greece. I always use it when we need to give to tourists information about Greece. I like it bcz you have personalized it and there are many funny things in it. what a great site!! i really enjoyed browsing thru it, very thorough, im sure travellers find it very useful. i really liked your songs too. i was sitting here at the office, bored to hell when i stumbled upon your site, just wanted to thank you for the company.. hehe. i must say that the cool thing about your site is the personal touch.. i think thats what mine lacks, maybe u could give me some tips? I am a second generation Australian of Greek parents who migrated in the 1970s. I have been to Greece twice and am planning my third trip for 2008. Each time I have found the experience to be confronting and thrilling. Thrilling because my entire extended family is there, and because Greece is like no other place in the world. Confronting, because it has also made me examine my sense of identity and the kind of life I would like to live. Thank you very much for your website - it provides a wonderful, balanced insight into Greece, both the good, the bad and the plain frustrating. It has helped me me make more sense of a culture which in many ways is so familiar and in many ways so different. I would like to thank you for your really great website on Greece. Whenever I want to find something (or show a friend something) about a particular island, or mainland destination, your website is the very first I turn to. I also just love to read about your experiences. I cannot believe how little I knew about the country prior to reading the information on your site! Thank you. I am from Australia and am not as lucky as you when it comes to the distance to travel to get there (many people in Australia tend stop for a day or two in Bangkok or Singapore these days to recover from the flight) and the monetary exchange rates! Did you know an AUD is only worth around 56 Euros now!?!?! Ouch. My mother and myself are going later in the year to visit my very old grandmother for 2 and a half weeks, and when I mean old, she's over 100 years old! Hopefully I'll go again next year to see the Olympics as I enjoyed them in year 2000 very much! Reading your site makes me drool with anticipation that much more. I've been to Greece 3 times prior (9 years ago I went there via the United States for a month... NYC, LA, Boston, Chicago, Washington DC, New Orleans, SFO, yadayadayada) and I find it very interesting how detailed your information really is! I am also so glad I had found someone like yourself Matt that knows about the island of Syros and who can teach me a thing or two! No one in Australia (friends, travel agents, etc) has any idea, and this is the island my Dad is from! People tend to go on about Mykonos, Santorini, Paros... but, I find there are nicer places to visit. I plan to go to Skiathos, Thessaloniki and Kefallonia maybe next year... as well as the usual places. Anyway, well done on a wonderful site. Great Web Site. I have lived in the UK for a long time but was born in Athens (and lived there for 6 years in the 80s) and visit 2-3 times a year . I can therefore appreciate your knowledgeable insights and have recommended your site to many friends. I would just like to point out a slight inaccuracy in your photo series on the Great Snowstorm of 2002. (wish I had seen that!). You need not worry about the neo-classical houses along Dionysiou Areopagitou Street - they wont be going anywhere as the museum site is not in that block and they are officially listed buildings (something that means more now than it did 30 years ago). My father was supervising engineer for the pedestrianisation scheme - I think you'll agree it is a great place to walk these days. the obvious love you have for the Country. I am a Greek American who has gone back to greece all but 2 years from 1994 - the present (I am 25 now). My family is from Trizina, up the mountain from Galatas, and very well known there. I just wanted to say that I enjoyed browsing through your site, looks like you have spent your times going thru Greece. I was surprised to see that you didn't have anything about the villages above Galatas such as Trizina/Damalas and the things they have to offer such as Devil's Bridge, the Lemon Forest, etc. Anyways, keep up the good work! Great site indeed. As a Greek-American or American-Greek if you prefer, I confess that your site is the very best. I saw the classified in Harper's and ventured into it. I have been spending 4-5 months in Greece every year since 1988 and while doing a six week stint for the U. of Cambridge, I travel throughout Greece. August and September I spend on my modest sailboat, currently in the Ionian Sea. I also have written about ten little tourist books in the process for the Efstathiades Group. They are tounge-in-cheek little things, ranging from " A visitor's guide to Greek driving and other paradoxes" to "How NOT to sail the Greek Isles". But I must profess my admiration for your work. Bravo!!! information presented in such a pleasant and easy to read way. explore the country in a more prudent way. I had already read your page on Sifnos before spending three weeks with the family this summer on Milos and Sifnos (what a swimming in Spilia!) and I must admit that it was that reading which to a large extent made us decide spending our vacation on the two islands. I would like to congratulate you on your great work (and terrific humor) and hope you don't mind linking your site on mine even though trendways.com is a professional financial site and has nothing to do with travels. I just felt I wanted to suggest your site as my favorite one on the net. By the way, I am Greek, born and living in Athens. I read today at ELEFTEROTYPIA for you. I was visited your site. I thought your more greek for many of us. Thank you as Greek . ps my grand fathers was from Mikra Asia. I belive that all peoples must and can be together. we imformed from the newspaper �Eleftherotypia� 02 sept 2003 on the existence of your web page. when you come you we call for �OUZO� and �SARDELES� �PASTES�. confirmation that I am not mad -or alone- to love this city. I will mention your www pages to everybody. I just want to thank you for greektravel.com. I am a first generation Greek-American in Chicago. I love traveling to Greece and I am planning a trip to the islands soon. I loved all the information I received on your site. I know I can always ask my family living in Greece for their opinions, but this site was organized so well that I don't feel I need to. Also, I just want to say that you really captured the Greece I know and love. You mention here and there about the pain one feels for Greece and you really brought that out in me when I read all the beautiful things our country has to offer. Pain and longing is what I feel when I can't be in Greece and live the lifestyle so different than my own. Thank you so much for all the insight. I�m a great fan of your site although I live in Athens myself, cause actually I grew up in the city of Larissa and I moved to Athens in 2002 for studies. I love this city so I walk a lot and sometimes (in my first days here) I acted more like a tourist and was so enthusiastic about discovering things! Anywayz, I saw that you actually mention the great snowstorm of 2001-2 in your site (back then I was in Larissa and I remember that up there it was even more cold than in Athens!!!). So listen to this: we had another severe snowstorm in Athens yesterday (not so bad as the one in 2001 though). The airport closed for about 24h and busses were not operating yesterday due to slippery ice on the streets, the national highway to Thessaloniki also closed between Kiffisia and Thiva, because some cars were not equipped with snow-chains and they blocked the highway not allowing the municipal snow-cleaners to get through and clean the way!!! It was not very bad though cause everything lasted only 24h and today everything is back to normal! I have been visiting your website for several years but hadn't ever emailed you. I am a first generation American born of Greek (naturalized US citizen) parents from Sifnos so you can guess which portion of your site I like to visit. I am one of the Podotas clan (maiden name). Anyway, to my point - I obviously enjoy your site tremendously and now have 2 children (3 & 5) that I'm sure will enjoy looking at it as they grow more familiar with Sifnos but today, I was going through your photo album (which I hadn't looked at before for whatever reason) and of course decided to focus on Sifnos. Well, when I got to the wedding pictures I thought - "gee, who will I recognize on these?" - and lo & behold, not only am I related to the groom, but the gentlemen reaching up to kiss him in the "wedding4" picture is my father. This brought tears to my eyes because my dad just recently went home after 6 months in the hospital. I haven't seen him (he's in Greece) for over a year and we just booked our tickets to go there this summer after not having been in 3 years. So it was a pleasant surprise and I know when I tell him he'll be tickled pink! Not that you can see his face but that won't matter. And you can just see my mother's hand but you know how their generation is - to have a picture on the internet will be special! I just had to write you and let you know how your pictures touch others. When I need a Sifnos escape at work, I logon and go to your site and today you made my day! Thank you! Hi Matt. I just wanted to write to tell you how much I enjoy your website. until I came across your site. 40% after I intervened in Greek to "assist" my friends from Canada. Anyhow - keep up the good work. I was really taken by your photos of the Peloponissos. I have family in a town near Molai and have many fond memories of relaxing summers there. It was really neat to see sights I have seen through your photos - makes me want to go visit again this summer. I would like to follow up on some of the people and places you had been to on my next visit... especially the "foreign" olive grower using the "foreign" name for the Peloponesse. Rather uncommon fellow it seems and probably has an interesting story. I also have reservations about "opening" Lakonia up to tourism. Did you hear of the road they wanted to build from Eleia - Githeo right along the Lakonikos Kolpos shore? So far it has been halted but what a tradegy if it went through since that is one of the few dune/grassland areas in Lakonia and is a nesting location from many birds and sea creatures. Thanks again for displaying your photos and for a nice website. In the future maybe we can keep in touch especially if you are planning another trip to Lakonia. Hi! I have just stumbled somehow on your athensguide.com site while searching something about Acropoli and I just wanted to say that I was very impressed!! I caught myself smiling while reading through the pages�.maybe because I live in Athens�. The photos on the athensguide.com and mattbarrett.net sites are exceptional!!!!!! I just wanted to tell you that site you created is VERY good!!! Good job my friend and I feel it was a VERY fair representation of what Greece is all about!! I have browsed your excellent,fun to read site many times and I have recommended it to even more people.I think it is time to say congratulations and wish you the best for you and your family.As a Greek,I am proud and happy that you have created such a site and I greatly appreciate the time and effort you have put in it. so incredibly engaging and personal...I love it! know if you're going to Greece this summer. As a Greek-American I lived in Greece for ten years and returned to the US for my graduate studies. I married a Greek- American journalist., and we have been traveling to Greece every summer untill the second baby came , and made traveling a bit harder. I came across your guide and I was amazed and happy to see what a wonderful guide you have put together. Your perception and desription deserve praise and honor from any Greek and the Greek government it self. Thank you for putting this together. Even though I graduated from a Greek High school in Athens , your site informed me about facts I was unaware. You made us proud and you made us laugh ( my wife and I) esspecially with your coffee story. Athens and Greece's guide site. Hope some Greeks love Greece as you do! I can describe your site in one word: FANTASTIC! Especially the humouristic way you describe the Greek life is great! I work for many years in Greece now and I recognized a lot. by god...it's very difficult to appreciate a civilisation, a mentality, an attitude to life so well if it's not woven into you as you grow up. if it's not the stuff that makes you up, the words you dream about at night. thank you for being one such soul. Thanks for all the info and the funny stories! I am a Greek-American who has been to Greece many times alone, but recently returned from a trip with my American husband and our 2 year old. The stroller story convinced my to take one, but until I read your article, I had been worried, remembering the rough streets and fast traffic. Now that we are back, I'm just dreaming of the next trip and reading more of your stuff! I will try to make this brief ( I could gush about Greece forever!). I was just having one of my very nostalgic yearnings for Greece today and I just loved that I could hop on your site to some what fulfill that desire. Of course hopping on a plane would be better but my student funds most likely wouldn't allow for it! I'm looking forward to checking our your olympics pics I was a volunteer for the equestrian event actually. It was an experience that is indescribable as your probably know. take care and keep up the site it is very usefull and great for us Greek enthusiasts! I was looking in Google for museums in athens and i accidentally found your web page. I was so impressed! You have done an excellant job! Imagine, I am from Athens and I dont know all of the things you have mentioned! I know....I m not proud of myself .....At least you made me feel proud of my home country, made me want learn more about it, even to think of going back.. Thanks for that! Thanks for loving it! You are a doll to put together such a beautiful website. Poli andras! I married a 2nd generation Greek American, so I'm adopted Greek. We've picked up the family olives in Kriti for years. I grew to love the winter months in the shadow of Psiloriti. Now I get homesick for my patrida just like any diaspora, and I love to listen to Greek music and get nostalgic. It's almost bedtime and I just taught my two little boys some simple step,cross back/step,cross front basic Greek folk dance moves to "Frangkosyriani" from your website. After their baths I'll stir a little honey and lemon in my faskomilo and read to the little guys from Ill Met By Moonlight by Stanley Moss. You're a good writer. Thanks for keeping your website up. I mean it. website. I really enjoyed it. places like London might be, we can't really live without it. professionally, or not? ) and have a nice summer. I just happened to your site when I discovered your nice pics from Athens in Google. I liked your daughter's effort too. Especially the article on Sifnos. I may be an Athenian but Athens environmental issues being the way they are, especially at summer, I prefer other places to spend my vacations on, so I spent a few summers in Sifnos. So a tip: Next time you get there, ask for a visit to the haunted church, on the way from Kamares to Stavri. Best time: nighttime, just before midnight around the end of August. (there, a tip you didn't know about). There are other places too where strange lights can be seen at night, but there, looking from outside you can see lighted candles, while if you open the door it's just a dark church. Thank you!!!!!! Your site is exceptional. Reading your words bring me back to a place where I feel as if I belong. I'm a Greek American, interestingly enough from the island of Lesvos. My father was born in Vatera, Lesvos. Lesvos is a magical place, I love it and with every wave crashing in on the shore, I hear my name being called as to say this is where I should return. You are doing a great service for us Hellenes and for the rest of the world, introducing our culture and way of life. Again thank you for all you do. If we ever would meet or have a chance to talk, we would have much to talk about, sardelles Kaloni, ouzo, and our beloved New York Mets. Again thank you for all you do. when and if I get there. I came across your website while searching for links for Greece for my friends and their upcoming journey. Needless to say that I was quite impressed with your work. However, the reason for this mail is not your site but your interview to Athens News. If you run for mayor, you have my vote. You will be happy to know that after the 2004 Olympics, Athina is a better place. Not perfect yet but better. We have a tram (cable car), which is ideal for a journey from downtown Athens to Glifada. It goes along the coast in a very slow pace. It seems that you haven't visited Glifada. An area that also has a lot of coffee shops and a good high street. Even though I live in Kipseli, 5 minutes away from Fokionos, I usually go to Glifada for coffee. I also want to mention that the phonetic pronounciation of greek words you provide, maybe easy for english-speaking people to say but also difficult for greeks to understand. Just my two cents on this, I could be wrong. Greece is a strange place and Greeks are strange people. Personally I dont like the attitude of my fellow country people (being p.c. here) and I dont expect to see much of an improvement any time soon. Hopefully, the members of my generation (I m 28) will help to make the life of Greeks and tourists better. My name is Michael Pikos, and as you can probably tell i am Greek. I am a 30 year old Australian Born Greek, and i have a keen sense of patriotism and am proud of the heritage left to us as modern day greeks. We have a holiday home in Kalymnos which is a little island near Kos, and we are frequently spending time in Greece. I now have a young family and will be taking my 2yr old daughter and 6 month old son to Greece in September to begin to introduce them to the love affair i have with our rich cultural heritage. You are propbably wondering where the hell this email is going, well in truth it is nothing more than a longwinded thank you. Thank you for your website, and for taking the wonder taht is Greece and showing it to the world. You have done a fantastic job, and i know many more are gratefull for all your efforts. Thank you for taking the time, and considerable effort to construct this comprehensive guide to Greece. You have done more to promote greece around the world than any one person or organisation i have heard of, and for this you should be commended. Mate if you ever happen to be in Brisbane, you are more than welcome to drop me an email before hand, and i would be more than happy to show you around my great city, and have a meal and a frappe at our local Kafenio. Once again mate well done. PS i will be sure to book a tour on the mainland through one of the tour operators you have recommended. I have been familiar with your Greece sites for over 10 years. It all began when my mother (who's family is from Crete) wanted to plan a trip to Lesvos for my father (who's family is from Mytilini and Plomari but had never been there). She used your hotel suggestions for what was a wonderful couple of weeks on the island. Beginning before that trip and continueing since, I have traveled to numerous parts of Greece numerous times (however, primarily to Crete). Now, my wife and I and our one year old son, Dimitrios, continue the tradition (my wife's father is from Crete and her parents now live in Rethymnon 10 months of the year). We are now considering a boating trip through some islands with your brother David or with BJ Leck ... but that won't happen for another year or so. In short, I just want to thank you for giving me a good reference point and a great place to visit on the web. I am writing to congratulate you on your excellent website on Greece...I am astonished by its quality and your good taste. I am a Greek immigrant living in the States, and I stumbled on your page by mistake. My first thought was - where's the "Back" button, uh oh, another American tourist uploading photos of tsoliades, beaches and souvlaki recipes...But after I gave it a closer look, I was really amazed...Your page pretty much summarizes the essence of my memories and homesickness. What I miss from back home is right there. I have two suggestions for you if you're interested. One, you can add Thanasis Papakonstantinou in your "musical suggestions" page, in my opinion he's one of the greatest modern folk/rock composers in Greece. And second, the Stoa whose photo you include is called Stoa tou Vivliou. Matt, thanks for such a good-looking and accurate resource. Matt.. I have written to you before to ask you about hotels in Athens, since then my father has bought an apartment in Peristeri, I have to tell you that even though I am only half greek by blood, I am all greek by heart and I love what you have done with your site. I love that you have put something so extravagent together to promote Greece. Keep up the wonderful work. We had email contact quite a while ago, when I was creating a greece portal as a final work for my edducation as a multimedia producer. I ascked you back then if you would be ok, with me translating some of your contents into german, refering and linking to you and your websites. as usual i got burried in so much work and personal stuff that i could never go online with my website... it still slumbers on a testserver with arround a hundred entries heheh. never the less it is so great to continuously stumbel over your websites and you as a person whenever i travel arround or read about greece. i love maia tsoklis tv shows about traveling as well as her magazine passport. this summer i stayed four months in greece, working through vpn connection for my office in switzerland. i bought her magazine and found an article about you... was lot's of fun to read her comments. just thought to drop you a fiew lines telling you how much of an inspiration you have bin for me... as well as a source for soothing my freequent homesickness. i quit my job a couple of weeks ago, finaly desciding to work independent and realize all those slumbering dreams. the greece project is ready for some reanimation ;-) i will be back in greece in spring... and plan to spend all summer there again. would be fun to drink an ouzo with a good pikilia together. until then I wish you and your family, all the best. Dear Matt, As an Army brat, I lived in Greece in the early to mid 1950s. I have spent the ensuing years of my life convinced that I am Greek. I became Greek Orthodox and after about 10 years the old Greek ladies decided that they would consider me Greek. Our daughter is Russian, but she thinks she's Greek, too. My husband just accepts it. I go back to Greece as much as I can. The reason I'm dropping you a line is to just thank you for your great website. Whenever I'm feeling "homesick" I go to your site and it makes me feel so happy! Thanks for all the information you provide. Whenever someone asks me for advice about Greece, I just refer them to you. You're the best!